The Marriage of the Virgin is part of an altarpiece created for a church at Citta di Castello, Italy and shows the marriage of the Virgin Mary and St. Joseph. The painting, an oil on panel, was completed in 1504 and is an example of Raphael’s increasing maturity and confidence as an artist. His colors here are vibrant, and the faces of his characters are specific and full of calm. In this painting, Raphael shows off his mastery of perspective, for the painting is dominated by a distinctly Italian Renaissance (as opposed to Roman occupied Palestinian) round temple in the background, in the frieze of which the painter has cleverly painted his name and, below it, the date. The front and back doors of this temple are open, and through it the viewer can see a bit of the hazy, sfumato painted background of hills and sky. The temple sits on a cascade of steps that lead down to a plaza with walkways that are picked out in a reddish stone. People in Renaissance garb gather in small groups, seemingly oblivious to the rather momentous marriage that’s happening in the foreground. In the foreground a richly attired high priest clasps the hand of both Mary and Joseph as Joseph prepares to place the ring on Mary’s finger. Behind her stand a group of soft-eye women, her kinswomen perhaps, whose attire is only a little less sumptuous than the priest’s. At the extreme left, the girl in red looks out at us, wistfully. Behind Joseph stands a crowd of disappointed suitors. Indeed, the one standing next to Joseph breaks his wand over his knee in what seems like resignation while another, sad-looking chap also bends his. As the viewer can see, the rod that Joseph holds has burst into flower, and the rods of the other suitors haven’t. Mary, dressed in traditional red gown and blue cloak with her hair held by gauzy veils, looks, well, virginal. Joseph, dressed in something like a priest’s cassock with his saffron colored cloak draped elaborately around him, looks a bit careworn and older than his bride — some legends claim he was a widower. Presaging the man who will become his foster son, he’s the only one of the suitors to wear a beard. He’s also the only person in the picture who is barefoot. 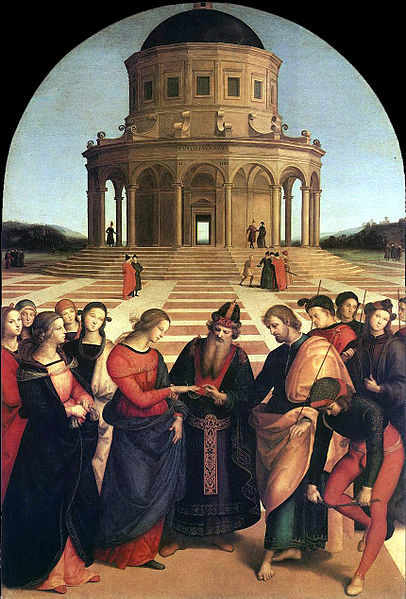 Raphael’s Marriage of the Virgin is now in the Pinacoteca di Brera, an art gallery in Milan, Italy. I’m really impressed together with your writing abilities as smartly as with the structure in your blog. Is that this a paid topic or did you customize it your self? Anyway keep up the excellent high quality writing, it is rare to look a great blog like this one today..